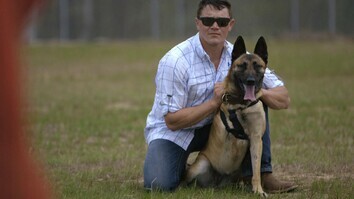 June 20, 2014 - With their keen sense of smell, dogs are an ideal companion for military and law enforcement officials looking to sniff out explosives or drugs. 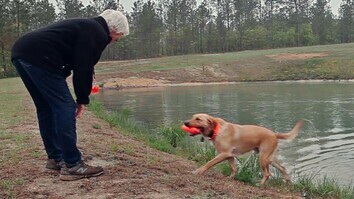 At K2 Solutions in North Carolina, handlers train dogs to identify these threats in real-world search scenarios. And as more U.S. troops come home from war, the organization is increasingly training service dogs to help veterans cope with post-traumatic stress disorder (PTSD). Seth: The human nose has about 6 million smell receptors in the there, compared to a canine’s which is roughly around 200 million. Seth: Think of a pot of stew. You know, when humans walk in we smell a pot of stew, beef stew or something like that. Dogs, when they walk in, they smell the carrots, they smell the potatoes, all individually. They can pull all those different ingredients out. Seth: A typical training scenario, we teach them the idea of patterns. They need to be able to search a number of different vehicles. Neil: The dog is taught to give a passive response to a sit. That response shows the handler that the odor is present. And then they get what’s called a reward or a cong and that is just a reinforcement. Neil: It’s a game for them. That’s all it is is just a game and if you didn’t have any kind of reward at the end of it the reward would become pretty boring. Stacey: At K2’s Canine Training Center we train everything from explosive detection dogs for the military, law enforcement, tracking, narcotics detection. Stacey: When the dogs are out front, their job is to find the bomb before the patrol gets to it. Patsy: We use orange bumpers because the dogs don’t see orange. Patsy: We’re trying to see how good their noses are, but we’re also teaching them to use their noses rather than their eyes. Stacey: I mean they’re saving lives. 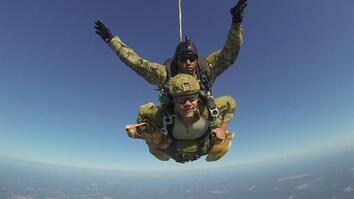 They’re saving 10s, 100s, 1000s, when you’re talking about 100s of dogs being deployed on any one…any one deployment. Stacey: As we transition into less of a war scenario, we’re now working on a service dog program so that we can provide service dogs to veterans with PTSD. Stacey: A lot of people think when we’re talking about working dogs, that they don’t have personalities, the dogs don’t interact with their handlers. You start listening to the stories of a certain dog it’s almost like somebody talking about a pet and yet we put that dog in somebody else’s hands to keep people alive. Stacey: It’s pretty powerful that you can have a dog that can have that kind of personality and still go work for somebody else and do the job just as well for them as they did for you.